With eCredable, build business credit by reporting your business utility and telecom payments to credit bureaus that maintain your business credit reports and scores. Your card will be charged a $49.95 one-time setup fee immediately. You will be charged $9.95 for each month you continue your subscription. Cancel anytime if not satisfied. There are no prorated or partial refunds of your paid month-to-month subscription fee once your card has been charged. Your eCredable account will remain open until the next billing period if you cancel, and your card will no longer be charged. 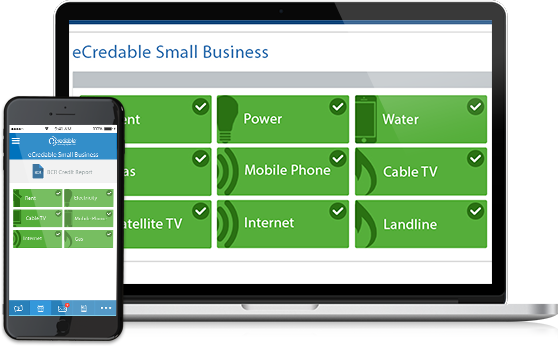 Link up to 8 eligible business accounts types 2 - Electricity, Water, Gas, Mobile Phone, Cable TV, Satellite TV, Internet and Landline. Requires online account access to the service provider’s website. We’ll attempt to download the maximum amount of payment history your service provider makes available online – up to 24 months. The number of months varies by service provider. We automatically report your monthly business phone, internet and utility payments to business credit bureaus. Reporting additional payment history to your business credit report. If your service provider does not provide 24 months of payment history online, we can manually verify the additional payment history at a cost of $19.95 per account and report the additional information to business credit bureaus. Payment history is one of the most important factors impacting your business credit scores. By reporting additional payment history to your business credit report, you can potentially increase your business credit score. eCredable reserves the right to determine which utility company accounts are eligible for linking with your eCredable credit file we compile and maintain. Certain accounts may not meet reporting requirements and not all accounts may be linkable. Only those accounts that are eligible to be linked can be maintained as Linked Accounts. Eligible utility company account types typically include Mobile Phone, Cable TV, Satellite TV, Internet Services, Landline Phone, Electricity, Water and Gas accounts for which you are the responsible party for payment. “Bundles” are treated differently by different providers. If the bundle contains multiple services (e.g. cable/satellite, internet or landline combined on one bill), and each service has a separate account number, we will treat each account number as a separate account in your credit file. If your utility company treats all the services in your bundle as one account with one account number used for payment, then you will only have one account for the bundle in your eCredable credit file. eCredable is not able to link to all U.S. Utility and Telecom Companies at this time. We are continuously adding new Companies, so check back periodically and see if your Utility Company is available. Ongoing automatic monthly updating of Linked Accounts requires that you have online access to your utility company, and that you opt-in to share your user ID and password with eCredable to create the link between your utility company’s online accounts and your eCredable profile. If your service provider does not have online access, or you do not have an online account setup with your utility company, eCredable cannot link your account and automatically update your monthly payment history.